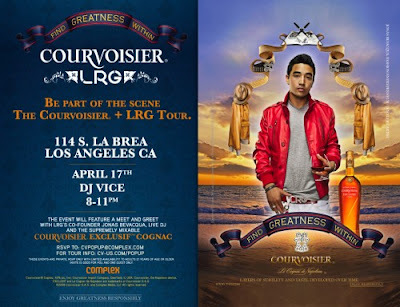 I was reading one of my favorite blogs, Nitrolicious, and came across this Courvoisier x LRG Launch tour. It looks like LRG has created a new line of apparel and accessories exclusively for Courvoisier Cognac who is also launching a new cognac called Couvoisier Exclusif. The tour will hit five cities; New York, Miami, Houston, LA, and SF. They’ll spend about three days in each city showing the line. The one in SF is April 24-26, taking over TRUE on Haight. Click here for more info about the tour and to sign up for the list.